This was a defeat on a scale without precedent in the era of universal suffrage, a rebuff more humiliating than any endured even by former British prime minister Ramsay MacDonald in 1924. Some 117 Conservatives voted against the signature policy of their own government, thereby triggering a motion of no-confidence that, in any normal era, would see the United Kingdom government toppled within hours. But such are these extraordinary times, that is not even the most significant story from Westminster. What matters more than the fate of this British government or this prime minister is the fate of the country and its decision to leave the European Union (EU), which is now suspended in a state of limbo if not purgatory. The law says Britain will leave the EU in 70-odd days. Yet, it has rejected the only firm exit path that exists. It means that unless something changes, Britain will crash out of the EU on March 29 without a deal — an outcome all but the most wild-eyed Brexiteers regard as an economic and social catastrophe for these islands. So how did it come to this? What led Prime Minister Theresa May, parliament and Britain to this moment? The answer you give will depend on how far back you want to go. 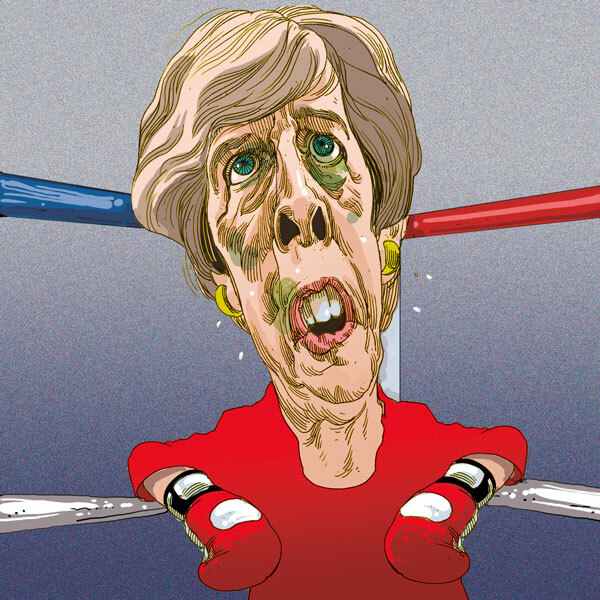 You could look to the snap election of 2017, when May threw away her majority, thereby leaving her at the mercy of a hung parliament, where Brexit lacked a majority just as surely as she did. As a simple matter of arithmetic, the defeat tonight was foretold on the night of June 8, 2017. Or you might go back a few months earlier, to the triggering of Article 50, which set the clock ticking on a negotiation for which May was palpably not ready. The cabinet was too split between Leavers and Remainers to know its own mind. Only in the last few months of the two-year period did the UK have anything like a position. Or you might say the die was cast much earlier, soon after May became prime minister and painted herself into a corner with a series of bright red lines. Once she had committed to leave the single market, customs union and jurisdiction of the European court of justice, and once she accepted that there could be no hard border in Ireland, then she had all but written the withdrawal agreement that the members of parliament rejected on Tuesday. The EU laws of physics dictated that there could be almost no other outcome. Of course, May’s drawing of those red lines was itself the fruit of another choice, a political decision that her best hope lay with placating the hardest Brexiteers in her party. In this, she was repeating an error made by former prime minister David Cameron in 2013, when he announced that there would be an in/out referendum before 2017. He, too, was seeking to placate the hard Brexiteers, seeking to blunt the appeal of United Kingdom Independence Party. That was another fateful decision on the road to the vote on Tuesday night — one that failed to see that asking voters to approve the status quo in the post-crash era was asking to be punched hard in the face. Critical, too, was Cameron’s conduct of the referendum campaign, with its serial failures — its appeal to voters’ wallets rather than their hearts, its refusal to attack the Tory leaders of the Leave campaign, its complacency. But Cameron also deserves blame for the manner of his departure. Had he delayed his resignation, he could have been around to frame what the referendum result meant. Britons clearly wanted out of the EU’s political institutions, he might have said, but they had not rejected membership of the common market. And so he could have advanced a Norway-style Brexit, one that would have minimised the harm. Instead he fled the scene of his own crime, leaving a vacuum into which rival definitions of Brexit could rush. Within weeks of his exit, Brexit was redefined in the hardest terms. Perhaps, though, the seeds of Tuesday’s vote were planted in the rubble of Britain’s wartime experience. Never occupied, many Britons never understood the intense need for the European Union as continental Europeans feel it. In 1984, at a ceremony to honour the fallen of Verdun, the then French president Francois Mitterrand and German chancellor Helmut Kohl held hands, in a powerful gesture of Franco-German reconciliation. According to her biographer, the then British prime minister Margaret Thatcher was unmoved, instead mocking at the sight of two grown men holding hands. Wherever you choose the starting point, the end point is clear enough. It ends like this, in the sight of a parliament paralysed by indecision, still unable to embrace Europe — but just as unable to break away. And in the spectacle of an island lost and adrift. Jonathan Freedland is a noted British political thinker and columnist.